Key Point of Passage: Jesus appeared to His disciples many times for forty days before they watched as He was taken up to Heaven. Memory Verse: Jesus will come back (Acts 1:11). 1) After Jesus died on the cross and came back to life, did he continue to appear to His disciples? 2) After forty days, where did the disciples see Jesus go? 3) Did Jesus leave us forever? Or will He come back? 4) And who did Jesus send to be with us while we wait? We’ll learn more about the Holy Spirit in a couple weeks. Key Point of Passage: Jesus Christ, the Son of God, was betrayed and crucified by men. Memory Verse: God loved the world so much that He gave His Son (John 3:16). 1) Why did the priests want to kill Jesus? 2) Who did Jesus say was His Father? 3) How did Jesus die? 4) Why did He have to die? 5) What happened three days later? Does anyone know? We’ll learn all about that story next week! We are all involved in spiritual warfare. The believer is to find strength in the Lord. Our job is to obey God and resist the devil. We have authority in Christ. 1. How are we to be in the Lord and his mighty power? What does this look like? 2. What happens if we submit to God and resist the devil? 3. Who ultimately has authority over Satan? 1. How can you be strong in the Lord? 2. What does it look like to be strong “in the Lord” versus being strong in your self? Can you tell of any experiences when you were strong in the Lord when in previous situations you had tried to be strong in yourself? 7. Prayer: This week, pray with your child against temptation. Ask for strength and protection in the areas you both struggle with. Pray also that you would be on your guard in areas where you feel strong. At the end of the week, ask your child how the week went. Key Point:God loved the world and sent His Son Jesus to die on the cross for our sins. Know What: Children will hear the story of Jesus’ prayer in the Garden of Gethsemane, and His betrayal, arrest, and crucifixion. So What: Children will learn that Jesus died for everyone so we could have eternal life. Now What: Children will play a game where they will answer questions and reflect on what they learned about Jesus’ last days. This verse reminds us Jesus went through all the pain and suffering He did because He loves us so much and wants to be Forever Friends with us. 1. What was the most loving thing Jesus did? 2. Why did He do it? Use this as an opportunity to discuss the gospel with your child. Bible Text: Genesis 15 click on link to see NIRV text). Key Point(s) of Passage: Abram was worried that because he did not yet have any children, that his servant would inherit everything. But God promised that not only would Abram have a son, but that his descendants would be as numerous as the stars in the sky. 3. Read v. 1. What is the very first thing God said to Abram? Why do you think God said that to him (why might Abram be afraid of God) ? 4. Also in v.1, what do you think God means when He says, “I am like a shield to you” ? How is God like that for you? 5. Also in v.1, what do you think God means when He says, “I am your very great reward” ? How is God a reward for us, too? 7. Read v. 4. But what was God’s reply? How do you think it felt for Abram -already an old man- to hear that he would finally have a son? 8. Read v. 5. Have you ever tried counting all the stars on a clear night? Do you think Abram tried counting all of them? 9. Read v. 12-14. How did God speak to Abram? Has God ever spoken to you in a dream or while you were sleeping? What did God tell Abram? (God told him prophetically [in advance] what would happen to Abram’s descendants when they became slaves in Egypt, and then were miraculously delivered in the Exodus and got to take treasures with them). 1. Find a nice, clear night when many stars are visible. If it is feasible, drive to a more rural location without many city lights. If available, bring a pair of binoculars or a portable telescope. Go outside and lay on your back and gaze up at the stars. See if you can count even a small portion of the stars in the sky without losing count! How many stars were you able to count? On a clear night, you might be able to see as many as 3,000 stars: http://media.caltech.edu/press_releases/11660. You could even help NASA in their Star Count program: http://www.nasa.gov/audience/foreducators/son/energy/starcount/index.html. Now what do you think it felt like for God to tell a childless Abram that he would have more descendants than he could count?! 2. Even though Abram might have been able to see 1,000s of stars that night long ago, we now know that there are actually billions of stars in the universe. It says in Ps. 147.4 that “He determines the number of the stars and calls them each by name”. God knows the name -not only of the 1,000s of stars we can see- but of each of the billions of stars that He made! And God knows each and every one of Abram’s numerous descendants, and each and every one of His followers. Though if you want, you can actually name a star too with http://www.starregistry.com/index.cfm. However, after you die and get to be with God, you’ll have to compare His original name for the star with yours! 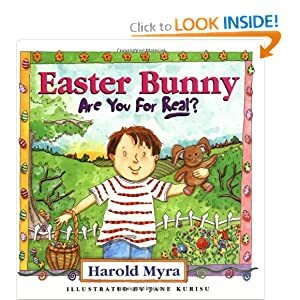 This board book teaches about the real meaning of Easter using different colors of things found in an Easter basket. It’s a simple, gentle introduction to the Easter story that could be easily duplicated in your child’s Easter basket. This book is a nice explanation of how we can enjoy many different things at Easter time (candy, dying eggs, new clothes), but that none of these things are the best thing about Easter. The book makes no mention the Easter bunny, if that is a concern of your household. Key Point of Passage: We must be ready for Jesus to return because He will come when we don’t expect Him. 1) Where does the Bible say Jesus will come from when He comes back for us? 2) Does anyone know exactly when Jesus will come back? 3) How can we “be ready” for Jesus to come back?